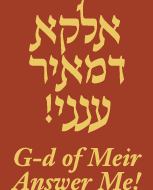 Rabbi Mordechai Veitzel Rosenblatt, or better known as Rabbi Mottele Oshminer was one of the greatest and most famous sages in the 19th and early twentieth century. It was said that three pictures hung on the wall of every Jewish home in Lithuania; the photo of Rabbi Nochum of Horodna, Rabbi Yitzchok Elchonon Spector, and Rabbi Mottele Oshminer. Rabbi Mordechai Veitzel Rosenblatt was born in 1836 in the city of Antipolya (Antapoli) near Kobrin in the Grodno region. Although his father Rabbi Avrohom Menachem Mendel had rabbinical ordination and was invited to serve as Rabbi in various cities, he preferred to make a living by engaging in the business of grinding wheat kernels, as his ancestors before him. This branch of the Rosenblatt family was therefore nicknamed "Veitzel", which in Yiddish means kernel of wheat. Rabbi Mordechai Rosenblatt was a great Talmudic scholar. At an early age he left Antapoli to study under Rabbi Isaac Tzvi Hirsch, the Rabbi of Siatitz, who enthusiastically gave him 'semicha' at the tender age of fourteen. After his marriage to Chaya, the daughter of Rabbi Shimon Velvel of Antapoli, Rabbi Mordechai moved to Pinsk and studied under the renowned Rabbi of Pinsk, Mordechai Zakheim who ordained him as a Rabbi. In Pinsk he developed a close relationship with the sage Rabbi Shmuel Avigdor of Karlin. After receiving rabbinical ordination from these two great rabbis he returned home in 1864 to Antipolia. He wanted to continue his studies quietly and unobtrusively, but his fame soon spread and he was invited to become assistant to the chief Rabbi of Antapoli, Pinchas Michoel Rokeach Grosleit, author of "Leket Hakotzrim", and "Divrei Pinchas", who cherished and dearly loved Rabbi Mordechai Rosenblatt as a son. It was during these years that Rabbi Mordechai Rosenblatt dedicated a part of his day to study Kabbalah. In 1870 Rabbi Mordechai Rosenblatt was appointed Chief Rabbi of Boten (Butten) near Grodno, a position he held for eighteen years. There he led a totally ascetic and abstinent lifestyle, and soon became known as a pious and sagacious Tzaddik, and Miracle Worker whose blessings were fulfilled. His fame grew and multitudes of people, Jew and non-Jew alike, including the nobility, flocked to him from near and far, to seek advice and receive a blessing. His photo hung in many homes throughout Lithuania as a Talisman. This was a remarkable and unique phenomenon, since Lithuanian Jewry was not as carried away by the concept of "miracle workers" as were the Polish, Russian, and Hungarian Chasidim. He was also very involved in doing acts of kindness to the townspeople and founded â€˜Chevras Malbish Arumimâ€™, to provide clothing for the city's poor and destitute, and â€˜Hachnasas Orchimâ€™ to provide lodging for itinerant wanderers as well as travelers. Sadly, his wife Chaya passed away in 1881, leaving him alone with a household of young orphans to bring up. In 1887 Rabbi Mordechai Rosenblatt was appointed chief Rabbi of Korelitz (Pinsk District) when the previous chief Rabbi Eliyahu Boruch Kammai moved away. Four years later, in 1891, he was appointed Chief Rabbi of Ashmina, a city near Vilna. In Ashmina he remarried; his second wife was the daughter of Rabbi Avraham Greenberg of Ashmina. Rabbi Mordechai wrote numerous rabbinical decisions in response to halachic questions which were sent to him for his legal opinion. Huge numbers of petitioners travelled to Ashmina from all over to receive a blessing and for his sagacious advice. Although in 1940 he moved to Slonim to serve as their Chief Rabbi, he is remembered best as Chief Rabbi of Ashmina. In the memoirs of a resident of Ashmina, the writer remarks that there were many mystical stories with Rabbi Mordechai. He tells one of these as follows as he heard from townspeople who hosted a woman with a deaf and dumb child: It happened that a woman came to the Rabbi with a child about two years old in her arms. Since the Rabbi was still in the Synagogue, the woman entered a neighboring house to rest there until the Rabbi returned. The woman told her hosts that she has been married to a man for many years but did not bear any children. Remarkably, two years ago she gave birth to the child in her arms. The little boy looked beautiful, but could not speak at all. The doctors claimed that he was a â€˜muteâ€™ and would never speak. When she heard this medical diagnosis she came to Ashmina to beg the Rabbi to bless her child and restore her speech. The Rabbi came home and the woman and her child left their belongings with the host and were led into the Rabbiâ€™s home. Shortly after that, the woman ran out of the Rabbiâ€™s house in great haste, her face wet with tears. She rushed back to get her belongings and then left town in a great hurry. It later became known that when the woman told the Rabbi about her child, he said: â€œPerhaps it is preferable that the child not speakâ€�. The woman cried and said that the boy was an only child and her only consolation in life. How could he stay a mute all his life? The Rabbi responded once again once more asked: â€œâ€œPerhaps it is preferable that the child not speakâ€�. When the woman was insistent that the Rabbi bless the boy with speech, the Rabbi turned to the boy and asked: â€œMy son, why do you not speak?â€� The child was silent. The Rabbi addressed the boy once more: â€œMy son, I ask you, why do you not speakâ€�? Then a miracle occurred. The child opened his mouth and said: â€œRabbi, what shall I say, that I am a bastardâ€�? The woman burst out into deep weeping and cried out: â€œRabbi, let him be silent, it's much better that he be silent all his life than speak!â€� With that she ran from the Rabbiâ€™s home. Rabbi Mordechai Veitzel Rosenblatt had two sons and two daughters. His oldest born Rabbi Asher Veitzel Rosenblatt was the Rabbi of Drohichyn, and one of the Rabbinical Board Members of Yeshiva Etz Chaim in Jerusalem which was established by Rabbi Shmuel Salant in 1841, shortly after Rabbi Salant arrived in Jerusalem. Rabbi Mordechai Rosenblattâ€™s second son, Rabbi Shmuel Yoshua Veitzel Rosenblatt was a great scholar who rejected all rabbinical offers, and instead engaged in business in Slonim. Rabbi Mordechai Rosenblattâ€™s sons-in-law were also great rabbis; one was the Chief Rabbi of the Goldlieve Congregation (Sobelsk District), and the other was Rabbi Eliyahu David Epstein, chief Rabbi of Boten (Grodno District). He was an older brother of Rabbi Moshe Mordechai Epstein, the famed Rosh Yeshiva of Slobodka-Hebron. Rabbi Mordechai Rosenblatt wrote hundreds of brilliant halachic decisions which were published by his students in 1899 under the name â€˜Hadras Mordechaiâ€™. Many of the great pre-war rabbis were either his students, or had received their rabbinical ordination from him. Rabbi Mordechai Veitzel Rosenblatt corresponded frequently with Rabbi Shmuel Salant, the Chief Rabbi of Jerusalem, and was instrumental in ensuring that the funds collected on behalf of Rabbi Meir Baal Haneis Salant reached their destination. In 1902 Rabbi Mordechai Rosenblatt wrote a very powerful and enthusiastic letter on behalf of Rabbi Meir Baal Haneis Salant which was printed in â€˜Gvul Olamâ€™ Jerusalem 1903. Rabbi Mordechai Veitzel Rosenblatt passed away in 1916 on the 28th of the first Adar at the age of 76. The titles that were engraved on Rabbi Mordechai Rosenblatt's gravestone speak volumes of the reverence and awe that he commanded. It reads: "Here Lies the Holy Ark, the Prince of Torah, the Storehouse of Fear of G-D, the Teacher & Light of Israel" Rabbi Yisroel Meir Hacohen of Radin, the Chofetz Chaim, said "Who is so great as to merit being with him in Gan Eden"! May the memory of this great Gaon & Tzaddik be a blessing to all.